I recently went away on holiday to Switzerland and today I want to share the first stop of my trip in Zurich. The first thing I did when I got off the plane was to purchase a ZurichCard. This pass is available for 24 hours at CHF24 or for 72 hours at CHF48. It provides free transportation in and around the city as well as discounted admission to museums. The airport is a 10 minutes train ride from the heart of the city and the fare is free with the ZurichCard. My first day started with a 2-hours city tour operated by the tourist information center that departed from the interior of the main train station (Zurich Hauptbahnhof, or more commonly appears as Zurich HB). Regular price is CHF25/person for the English tour and there is a 50% discount with the ZurichCard. On the walk...the view from Lindenhof of the tower of the Predigerkirche in front of University of Zurich with Swiss Federal Institute of Technology (ETH) Zurich on the left. The view from Lindenhof of the the two towers of the Grossmünster. There are fountains everywhere in Zurich providing drinkable water for both people and pets. This is one of the more modern fountains in the city. A 3D map of the city layout in the 1800s. After the tour, my friend and I visited the interiors of the Grossmünster and the Fraumünster churches. The day ended with a few hours in the Kunsthuas art museum (a CHF5 discount on admission with the ZurichCard). An English audio guide is available. 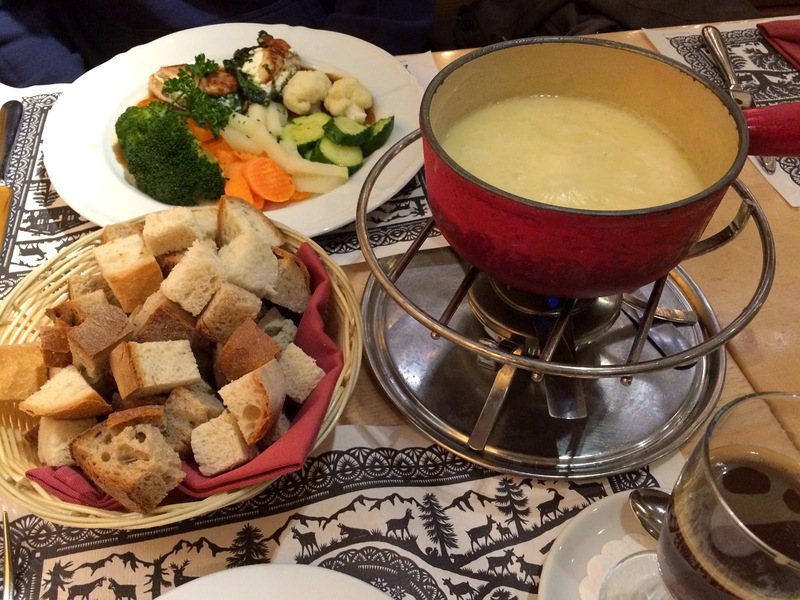 For dinner, I went with some classic cheese fondue at Swiss Chuchi. The taste was a bit heavy on the white wine for me, but my friend enjoyed it just fine. The second day started with a morning excursion to Uetliberg, a local mountain easily accessible from Zurich HB. The train fare is included with the ZurichCard. Otherwise, return fare (priced as a 24 hours pass) is CHF17.20 (purchased on the day of travel). We budgeted about two hours for this trip, including commute time. The 10-minute hike to the top. Overview of Zurich through the fog. After returning to Zurich's old town, my friend and I visited Cafe Conditorei Schober-Péclard for some warm drinks and a snack. The interior of the cafe is beautiful, with the seating area sectioned into rooms with different themes. We sat near the windows for some people-watching while splitting a delicious Flammkuchen. A walk around Lake Zurich. Mini macarons by Confiserie Sprüngli where I also picked up with some truffles. The last stop was a visit to the Beyer Watch and Clock Museum, which houses a private collection of time pieces through time. Admission is CHF8 and is free with the ZurichCard. There is an informal tour available in English if the museum is not too crowded. This brings an end to my stay in Zurich where I had a good dose of cheese, chocolate, and time pieces. The city feels very authentic and serene. I really enjoyed my time there. On to Lucerne!.